1 In a small pot, bring 270 ml (approximately 1 cup) water, canola oil and a pinch of salt to a boil. While stirring with a whisk, sprinkle cornmeal into pot and cook 5 minutes. Remove from heat. 2 Beat eggs in a mixing bowl with a hand mixer until fluffy, gradually adding 70 grams (approximately 4 tablespoons plus 2 teaspoons) sugar. 3 Gradually pour hot polenta into egg mixture, stirring constantly. 4 Mix flour and cream of tartar in a bowl and fold into the cornmeal mixture. 5 Line a baking sheet with parchment paper, cover with batter and smooth with a rubber spatula. Bake in preheated oven at 200°C (fan: 180°C, gas mark 3) (approximately 400°F/convection 350°F) on middle rack for about 20 minutes. 6 Meanwhile, rinse raspberries and press about 350 grams (approximately 12 ounces) through a fine sieve into a small bowl to create a puree. 7 Mix raspberry puree with remaining sugar and season to taste with sweetener. Fill a small freezer bag with mixture, seal the bag and cut a small tip. 8 Remove baking sheet from oven and place on a work surface or an upturned oven rack. 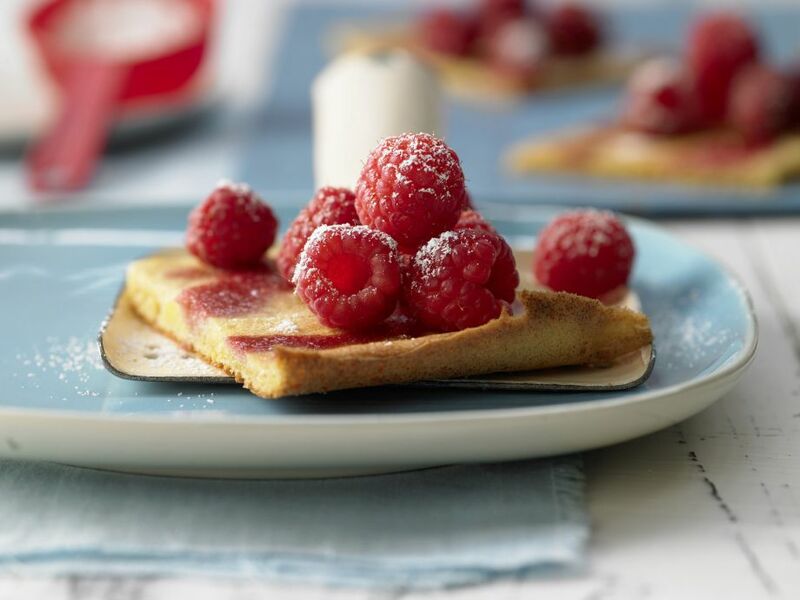 Immediately pipe raspberry puree in wave-like strips on hot tart. 9 Let tart cool completely for about 30 minutes. Before serving, cut into 20 pieces, cover with remaining raspberries and sprinkle with powdered sugar to taste.